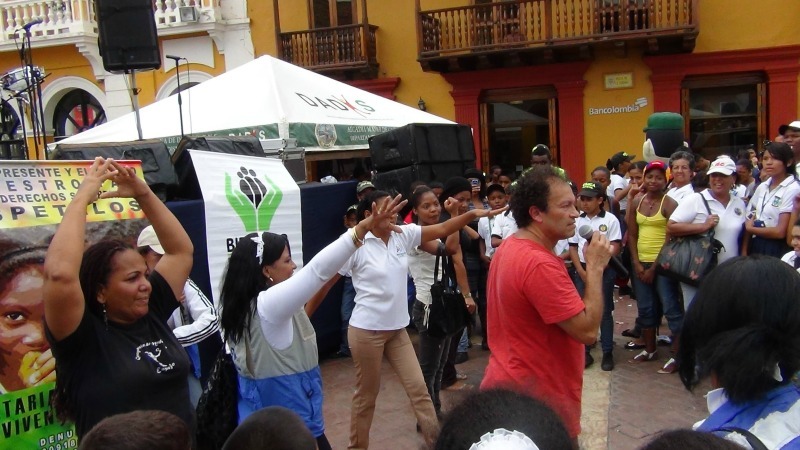 This year ImaginAction’s director, Hector Aristizabal, will return to his native Colombia to build on our work of the past 15 years and develop new initiatives in collaboration with several international organizations and with our partners, Corporacion Otra Escuela and Universidad del Bosque. psycho-social intervention in communities. We will also address the need to design healing rituals -when appropriate – as a way to provide a container for the many wounds that are often addressed during our work. Finally we will do an intervention using the methods in Caucasia, Antioquia with one of the many communities in which IRD has invested a great deal of work. ImaginAction and Otra Escuela will continue their collaboration to offer training to a team of OIM social workers and therapists tasked with identifying and training grassroots leaders in Colombian communities affected by violence and forced displacement. This experiential and theoretical training will help the OIM team learn about the use of theater as a social laboratory and as ritual for social transformation and healing. Ritualidad en la Construccion de Culturas de Paz. Taller sobre teatro y ritualidad ofrecido en colaboracion con Corporacion Otra Escuela y La Minga. Para mas informacion mirar los detalles aqui. Our director, Hector Aristizabal asistira un mes de entrenamiento con Beatriz Camargo y otros maestros y maestras en la Maloka del Teatro Itinerante del Sol localizado en Villa de Leyva, Colombia. El tema de este ano sera la relacion entre ciencia y ancestralidad que sera explorado utilizando el tetaro como ritual y la metodologia del Bio Dharma desarrollada por Beatriz Camargo. Our director, Hector Aristizabal will be offering a Theater of the Oppressed training in Gaziantep, Turkey. This training will be directed toward the psycho-social team of GIZ that is currently working inside war turned Syria. There will be a second installment of this training in November 2015. Hector will be working in Nepal with theater practitioners currently using theater with victims of the recent earthquake in that country Please stay tuned for more information about these projects as we may be able to offer .